All PVS-14s are Exelis GEN III Pinnacle Auto Gated image intensifier tubes. 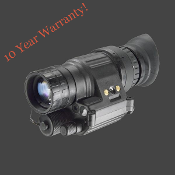 The AN/PVS-14 Monocular Night Vision Device (MNVD) is in widespread use by the United States Armed Forces as well as NATO allies around the world. It uses a third generation image intensifier tube, and is manufactured by the ITT Corporation (Now Exelis). It is often used 'hands free' using a head harness or attached to a combat helmet such as the PASGT, Advanced Combat Helmet, or Marine Lightweight Helmet. It can also be used as a weapons night sight. In addition, it was part of the equipment fielded in the U.S. Army's Land Warrior program. The PVS-14 is used by the Law Enforcement community under the name "Night Enforcer NEPVS-14".